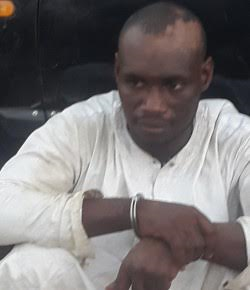 According to 35 years old Mohammed Sani Nafiu (pictured) who was yesterday May 2nd, paraded by the Nigerian Army as one of the suspected killers of General Mamam Shuwa, has revealed he was framed by the military. According to Vanguard, Nafiu who is said to be a Boko Haram kingpin, was arrested at Hotoro General area of Kano municipal. A GSM and a total sum of N300 was recovered from him. “I don’t know anything about General Shuwa’s death. I was arrested from my home to the detention centre, and they are trying to frame me. I must make myself clear, I have no hand in General Shuwa’s death”. A top military personnel who spoke on the condition of anonymity, discredited Nafiu's claim, saying that the suspect is a pathological liar.